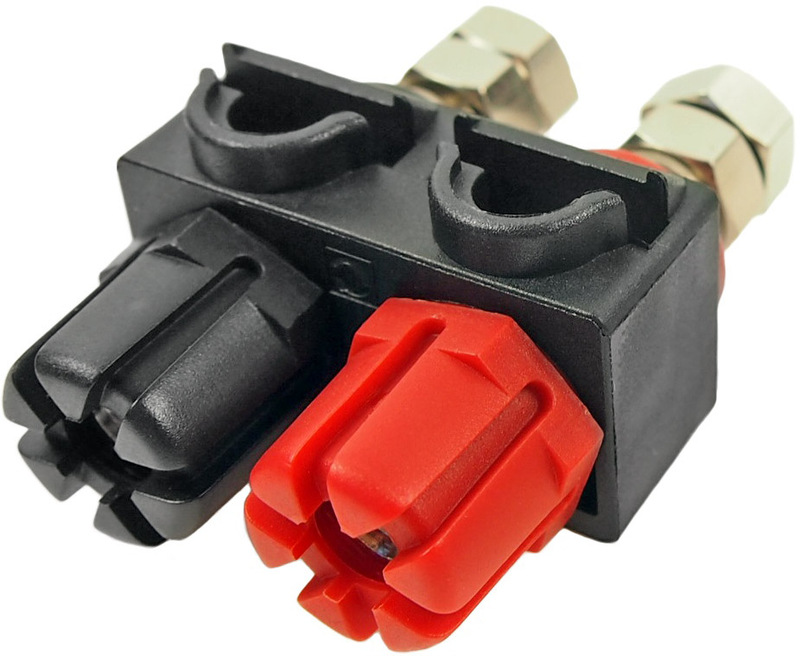 The Cliff™ range of dual terminal binding post assemblies is designed for use in varied applications including professional and consumer audio, test and measurement, power supplies and industrial uses. Terminal spindles and mounting hardware are manufactured from high quality solid brass, either nickel or gold plated. Plastic parts are moulded molded from tough glass reinforced nylon or polypropylene. TPP4 and TPP5 assemblies are fully insulated and touch proof to reduce the risk of accidental electric shock in higher current applications and also comply with European safety regulations. TPP4 and TPP5 assemblies are touch proof to reduce the risk of accidental electric shock in higher current applications. Printed circuit board mounting versions available. All assemblies are supplied with terminals pre-assembled into the top mounting plate and with two plain washers, two spring washers, (except TPP4), and four nuts. TPP3 and TPP5 have a 10 x 32 UNF thread. TPP4 has 2BA thread as standard and is also available with 10 x 32 UNF thread. All models can be supplied with either a nickel or gold plated finish and different stud lengths are available on certain models. Clear plastic knobs and fittings can be supplied on custom versions. 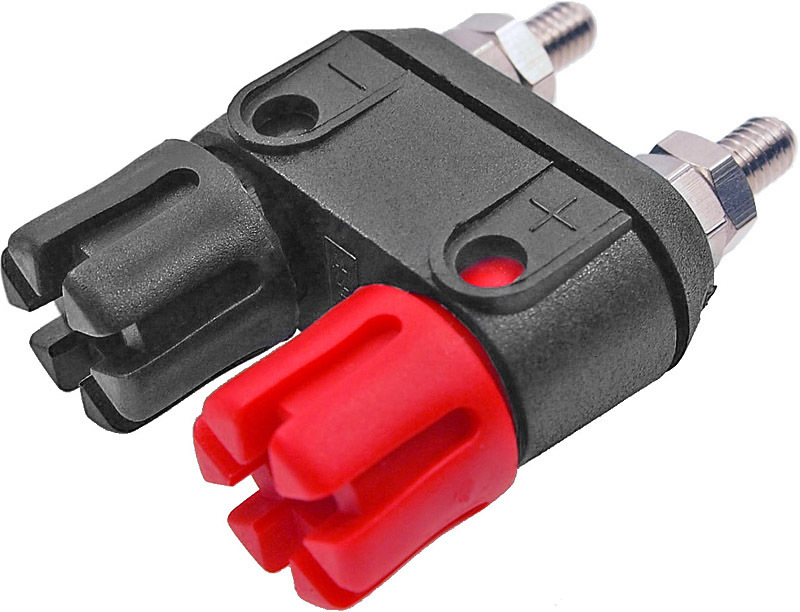 Red and black blanking plugs are available for inserting into the 4mm end-holes to comply with European safety regulations. Maximum Current: 30A, (TPP60 is rated to 60A). 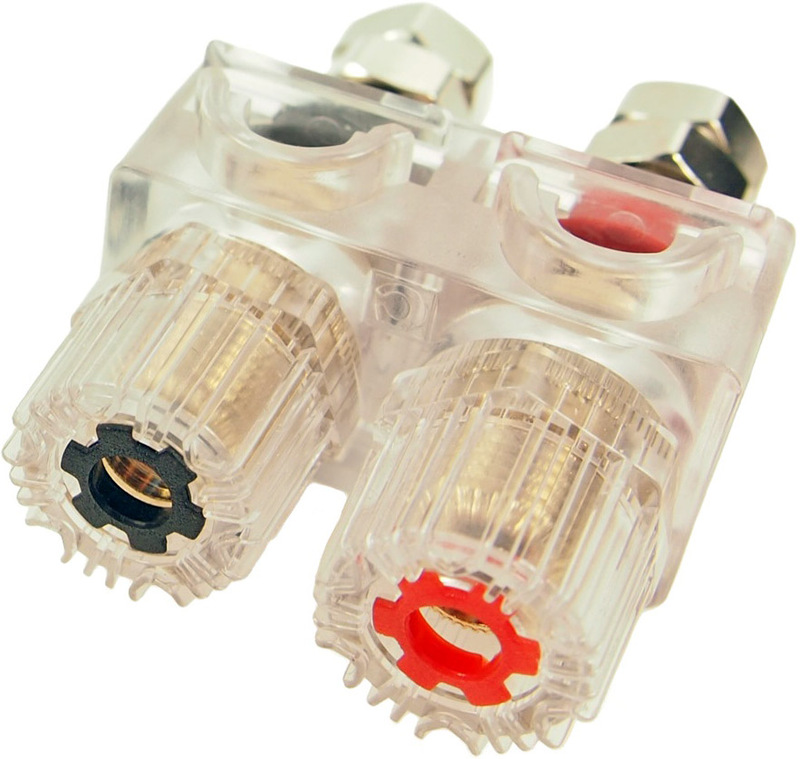 TPP3 Non touch-proof dual assemblies. Ø4mm cross hole. TPP2 also available with a Ø2mm cross hole. CL159702 TPP3MS 2BA in gold plate with no nuts or washers. FCR159701 TPP3C assembly in nickel with a 10x32 UNF thread. TPP4 Fully touch-proof dual assemblies. UL approved and comply with BS EN 60065 section 15 European legislation requirements. Ø4mm cross hole. These are supplied with a plain threaded spindle rather than solder spill. TPP5 Fully touch-proof dual assemblies. UL approved and comply with BS EN 60065 section 15 European legislation requirements. Ø4mm cross hole and spade terminal slot. CL159706X1 TPP5 red and black assembly. CL159706X5 TPP5R black and red assembly. CL159706YA TPP5MSG red and black assembly, gold plated. TPP5CT PC Fully touch-proof dual assemblies. UL approved and comply with BS EN 60065 section 15 European legislation requirements. Ø4mm cross hole and spade terminal slot. For PCB mounting. CL159706PA TPP5CT PC red and black assembly. CL159706PB TPP5CT PC black and red assembly. TPP60 Dual version of TP60. Rated 60A with 3mm wide slot and 6mm diameter cross hole. Nickel plated, short, long or PC mounting spindles. Coloured, Colored, castellated knob. CL159855 TPP60S Red/Black, nickel plated. CL159856 TPP60S Black/Red, nickel plated. TPP60V Dual version of TP60. Rated 60A with 3mm wide slot and 6mm diameter cross hole. Gold plated, short, long or PC mounting spindles. Clear, fluted knob. CL159840C TPP60VSG Clear, Red / Black, gold plated. CL159841C TPP60VSG Clear, Black / Red, gold plated. Please also see our spring terminals.